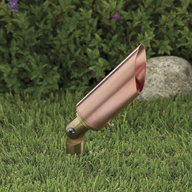 Compact and sleek, this low voltage up & accent fixture is constructed of heavy-gauge, extruded, solid copper. The fully rotatable shroud is fitted with a silicone o-ring gasket to ensure a superior weather-tight seal under harsh conditions. A clear, tempered, shock and heat resistant soda-lime glass lens safeguards the lamp and optics. The intelligently engineered fully adjustable knuckle is made from solid brass and isolates the fixture from the harmful corrosive soil. The 2111 is shipped with a standard 20W MR11 lamp, unless otherwise specified. Mounting hardware is included – choice of ABS ground stake, mounting canopy, or tree-mount canopy. 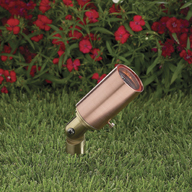 Vesatile and powerful, this low voltage up & accent fixture is constructed of heavy-gauge, extruded, solid copper. The fully rotatable shroud is fitted with a silicone o-ring gasket to ensure a superior weather-tight seal under harsh conditions. A clear, tempered, shock and heat resistant soda-lime glass lens safeguards the lamp and optics. The intelligently engineered fully adjustable knuckle is made from solid brass and isolates the fixture from the harmful corrosive soil. The 2116 is shipped with a standard 20W MR16 lamp, unless otherwise specified. Mounting hardware is included – ABS ground stake. 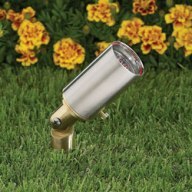 Vesatile and powerful, this low voltage up & accent fixture is constructed of heavy-gauge, stainless Steel. The fully rotatable shroud is fitted with a silicone o-ring gasket to ensure a superior weather-tight seal under harsh conditions. A clear, tempered, shock and heat resistant soda-lime glass lens safeguards the lamp and optics. The intelligently engineered fully adjustable knuckle is made from solid brass and isolates the fixture from the harmful corrosive soil. The 2116 is shipped with a standard 20W MR16 lamp, unless otherwise specified. ABS ground stake. 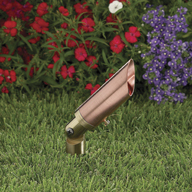 Compact yet powerful, this low voltage up & accent fixture is constructed of heavy-gauge, extruded, solid copper. The lamp housing is fitted with a silicone o-ring gasket to ensure a superior weather-tight seal under harsh conditions. A clear, tempered, shock and heat resistant soda-lime glass lens safeguards the lamp and optics. The intelligently engineered fully adjustable knuckle is made from solid brass and isolates the fixture from the harmful corrosive soil. The 2120 is shipped with a standard 20W MR16 lamp, unless otherwise specified. Mounting hardware is included –ABS ground stake. 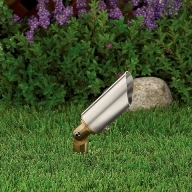 Compact yet powerful, this low voltage up & accent fixture is constructed of heavy-gauge, Stainless Steel. The lamp housing is fitted with a silicone o-ring gasket to ensure a superior weather-tight seal under harsh conditions. A clear, tempered, shock and heat resistant soda-lime glass lens safeguards the lamp and optics. The intelligently engineered fully adjustable knuckle is made from solid brass and isolates the fixture from the harmful corrosive soil. The 2120 is shipped with a standard 20W MR16 lamp, unless otherwise specified. ABS ground stake. Material: CopperVesatile and powerful, this low voltage up & accent fixture is constructed of heavy-gauge, extruded, solid copper. The fully rotatable shroud is fitted with a silicone o-ring gasket to ensure a superior weather-tight seal under harsh conditions. A clear, tempered, shock and heat resistant soda-lime glass lens safeguards the lamp and optics. The intelligently engineered fully adjustable knuckle is made from solid brass and isolates the fixture from the harmful corrosive soil. The 2116 is shipped with a standard 20W MR16 lamp, unless otherwise specified. Mounting hardware is included – ABS ground stake.